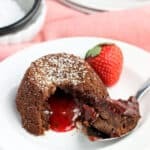 These mini chocolate strawberry lava cakes feature a rich molten chocolate and strawberry center and are EASY to make. This small-batch recipe yields just four mini lava cakes (and uses a muffin tin). Okay, so these mini chocolate strawberry lava cakes come as a semi-sharp contrast from the healthier eats that have been gracing the blog lately. That I know. 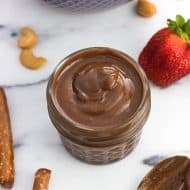 But I’m a whole-hearted believer in everything in moderation, and I think a chocolate dessert after days of kale, lean protein, whole grains, and remembering to take my vitamins is well deserved. Plus it’s a mini dessert, which helps in the sweets justification. Chocolate-covered strawberries hold such significance in my memories, besides the fact that I think to myself “OMGILOVETHESE” every time I eat one. Right after college I was eyeballs-deep into the CPA exam. Like a week after graduation I put on my special study sweatpants and parked myself on the couch for a few months (and then any time not at work after that). 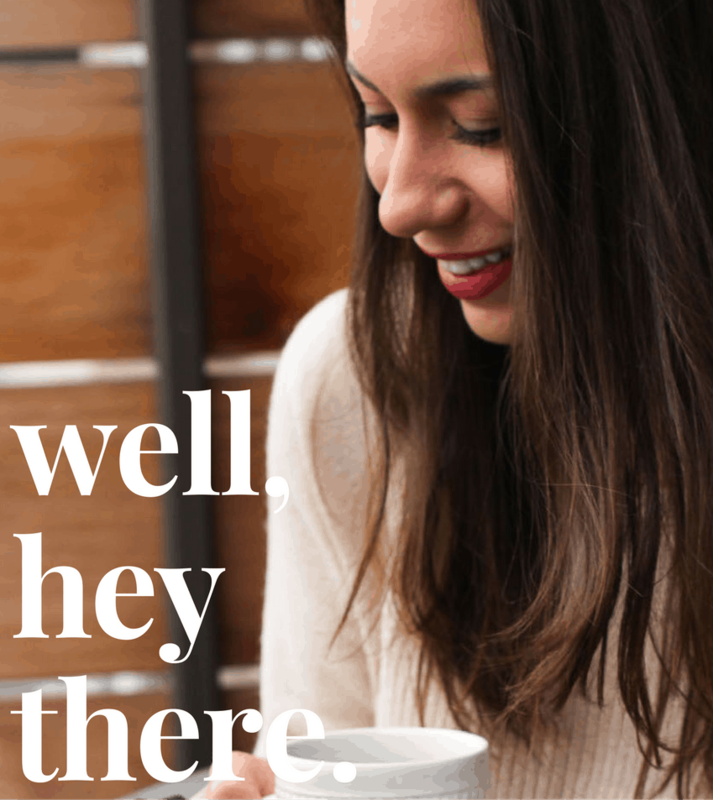 There are four sections (meaning four exams) throughout the thing, and with my highly-developed capability for worrying, you can imagine my nerves on and before exam days. Oooof. So nervous, that my rock star dad drove me the half-hour to the exam center so I could try and calm myself before the big event. After all was said and done I would joyously skip to the car, and without fail my dad would have a few chocolate-covered strawberries sitting on the passenger seat for us to devour. Nothing like a little chocolate for celebration! Needless to say the flavor combination of chocolate + strawberry is still one of my favorites, long after those pesky exams were over (and let me tell you, woot woot for that). Nowadays I like to enjoy chocolate-covered strawberries for other types of celebratory occasions…like Valentine’s Day! 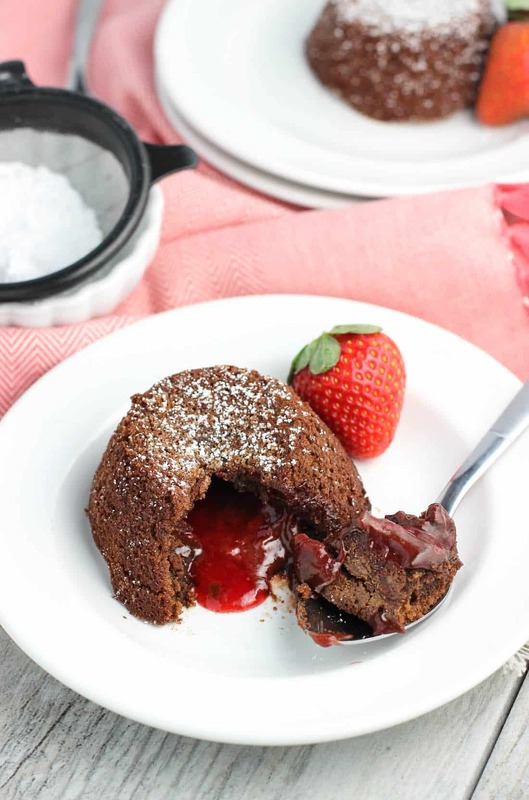 These mini chocolate strawberry lava cakes are richly flavored and individually-sized, which works out nicely with the whole portion control thing. Plus they’re surprisingly simple to make (I didn’t believe it at first). Lava cakes are one of those desserts that I always assumed were designated as dinner-out treats only. So fancy! I totally can’t figure out that molten center at home without cursing at least three times and making a colossal mess, right? Wroooong. 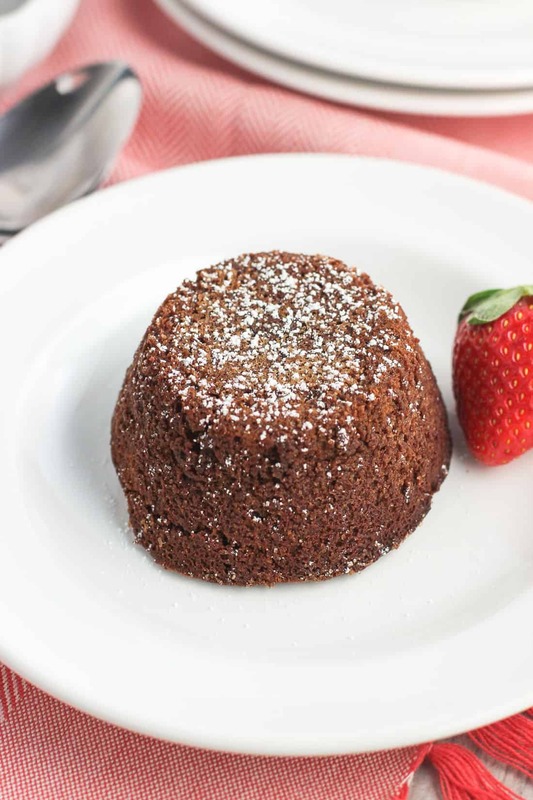 For these chocolate strawberry lava cakes, butter and chocolate chips are melted together on the stovetop, while flour, sugar, espresso powder, an egg + an egg yolk, and vanilla extract are mixed together in a bowl. The butter/chocolate mixture is stirred into the bowl with the other ingredients and there ya go. Somehow while baking, the molten center forms while the exterior bakes into a cake. Chocolate lava cake magic. 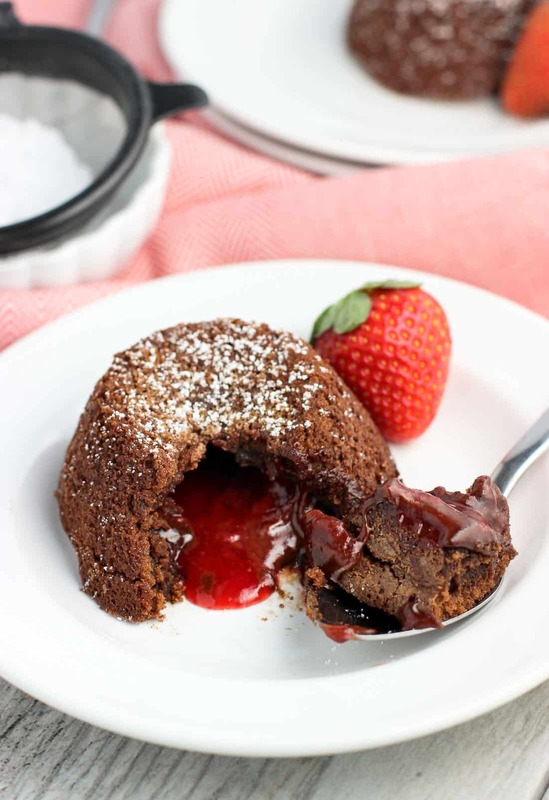 This version features a little extra something special in the form of strawberry preserves added to the mix, which join with the molten chocolate goodness to make a truly decadent strawberry chocolate lava cake. We devoured these on our practice Valentine’s Day, which is something that tends to happen in advance of holidays when you’re a food blogger. 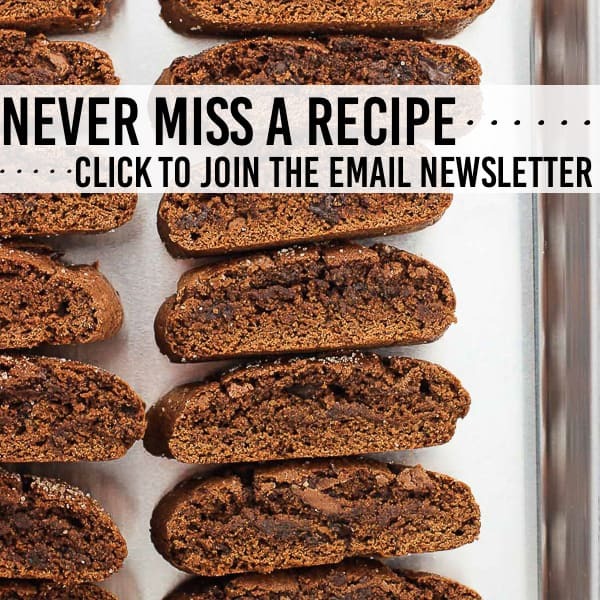 For practicality purposes it makes sense to share recipes before the actual holiday itself, but let’s be real – turn down an extra opportunity to enjoy chocolatey sweet treats? Nope, not gonna happen around here! Though we both agreed, these are already on our Feb. 14th menu, too. 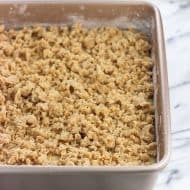 Preheat oven to 400 degrees F. Generously butter four cups of a standard-sized muffin tin and sprinkle each with a bit of granulated sugar to coat the bottoms and sides. 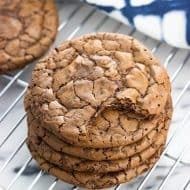 Add butter and chocolate chips to a small saucepan and heat over low heat, stirring until the mixture is melted and smooth. 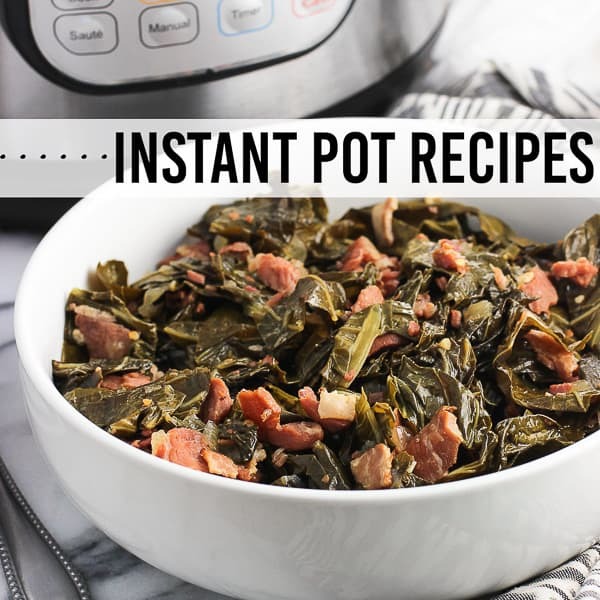 Remove saucepan from heat and let it cool a little bit. 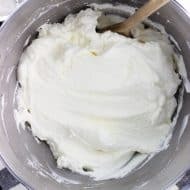 Whisk together flour, confectioners' sugar, espresso powder, whole egg, egg yolk, and vanilla extract in a bowl until evenly mixed and creamy. Whisk in melted and slightly cooled butter/chocolate mixture. Pour mixture evenly between four prepared muffin cups. Add about 1 tablespoon of strawberry preserves to the center of each lava cake. The batter will be fairly thick, so you may need to press the preserves into the center of each with a spoon or a spatula. Using the spoon/spatula, smooth some of the lava cake batter over top of the preserves, which are now under the surface. You shouldn't see much of the preserves, if any at all, once done. Bake for 11-13 minutes, or until the tops have firmed/stiffened up and the edges have browned. You'll notice the outside edges will begin to appear "drier" as they bake, which will continue inward as each lava cake puffs up slightly. The center of each may still appear sunken in a bit due to the preserves. Once done, remove from oven and let sit for 5 minutes. Carefully loosen the edges of each lava cake with a knife and invert onto a plate. 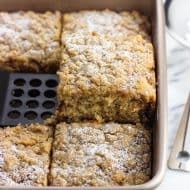 Sprinkle with confectioners' sugar if you like and serve immediately. The butter + chocolate mixture is cooled slightly to reduce the risk of the warmth "cooking" little bits of the cold egg/egg yolk when the two are combined. 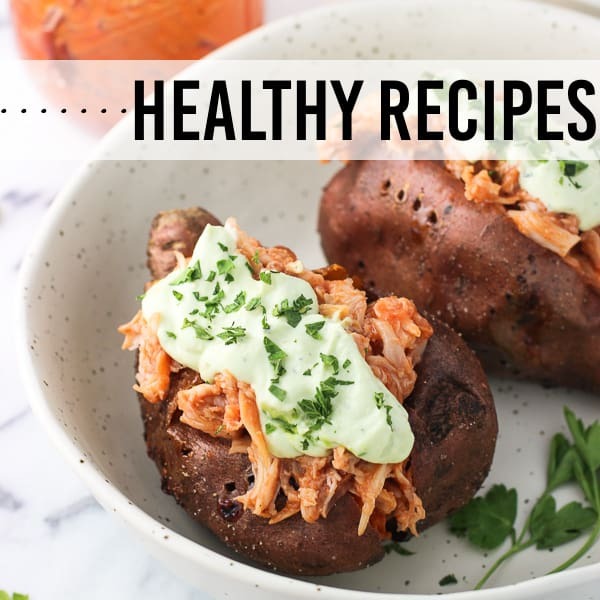 You can get around this by bringing the egg and egg yolk to room temperature before beginning, or you can let the mixture cool for 5-10 minutes. I let the mixture cool and did not have an issue. When measuring flour, be sure to use the "fluff, spoon, and level" method. Using a spoon, stir the flour in the bag/container. Using the spoon, spoon flour into the measuring cup, making sure not to pack it in. Using a straight-edge (I like to use the straight handle of the spoon), level off the flour in the measuring cup, with the excess falling back into the bag/container. If you pack in the flour, odds are you'll add too much to the recipe. To make it easier when you invert the cooked lava cakes on to a plate, I suggest using four muffin cups that are in a square: two in one row and the two right below them. Don't stress when it comes to adding the preserves - it's not a precise science. The magic of lava cakes is that the molten center forms where it's supposed to be without much direction from you. The nutritional info is estimated for one whole lava cake, though they work well as a dessert to be shared as well. 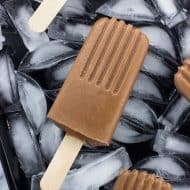 Every day requires chocolate 😉 These look fabulous. I’ll have to face my fears and make lava cakes soon! I agree with you 100% Megan! 🙂 Thanks! Haha I was so thankful! I was a mess on those days. And I hear you! We don’t always have fresh, perfectly juicy strawberries but we always have preserves. 🙂 Thanks Ashley! My brother just passed his accounting exam in December, and I never realized how intense it was! That’s so sweet of your dad to drop you off and bring sweets for a celebration 🙂 These molten cakes look TOO GOOD! I want one for breakfast right now, please?! Thanks Denise! These would be a surefire way to start your day off on a sweet note. 😉 And congrats to your brother! I don’t think I’ve ever slept as soundly as I did the nights after taking the exams. Gah, how stressful. Holy smokes!!! These are the prettiest lava cakes ever! The chocolate strawberry combo is just brilliant! 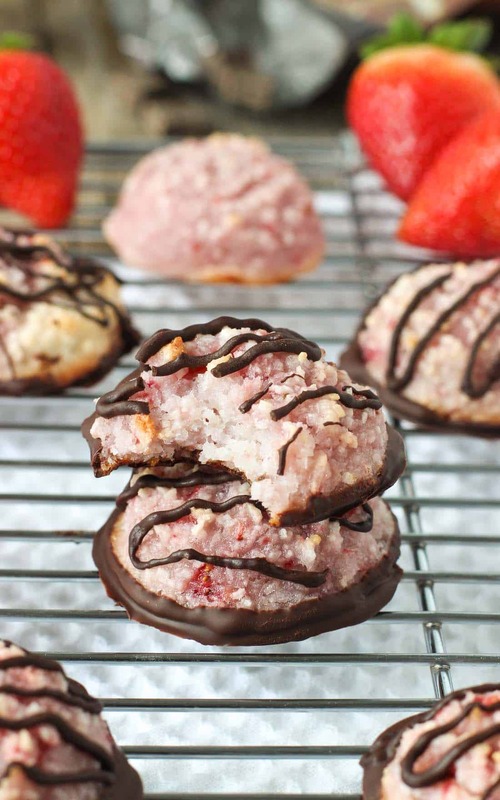 Chocolate + strawberry is just the best! These are so so fun! I love the spin on just straight up chocolate lava cakes!! I’m on a huge chocolate/strawberry kick haha thanks Ashley! I think I need to make some lava cakes…right now! How cute are these?! I love that they have molten chocolate AND strawberry! So perfect for Valentine’s Day!